Relax in this comfortable 1930’s home decorated with antique furniture and old wares. 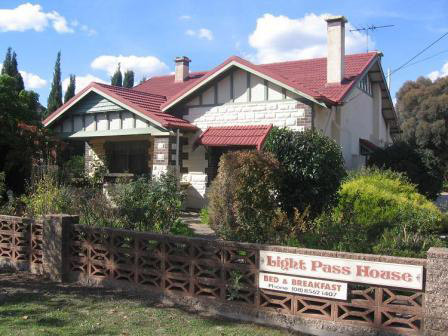 Positioned in a tranquil garden setting between two churches in the quiet historic village of Light Pass, 3 km drive from Nuriootpa. This sole occupancy property consists of 2 large bedrooms, dining room, lounge (with TV and DVD player), kitchen, bathroom, laundry and BBQ. There is a rose garden, large gazebo and shaded parking available at the rear of the house. Each bedroom has a queen-size bed, with one bedroom having an additional bunk bed. The house has ducted reverse cycle air conditioning with a slow combustion heater in the lounge for extra cosy winter nights. Fresh flowers, sparkling wine and treats are included. Breakfast provisions, (bacon & eggs, bread & spreads, cereals and juice) are included. A ‘portacot’ is available on request. Max number of Persons: 6.